http://durgan.org/2017/March%202017/28%20March%202017%20Brussels%20Sprouts%20Seedlings./HTML/ 28 March 2017 Brussels Sprouts Seedlings. 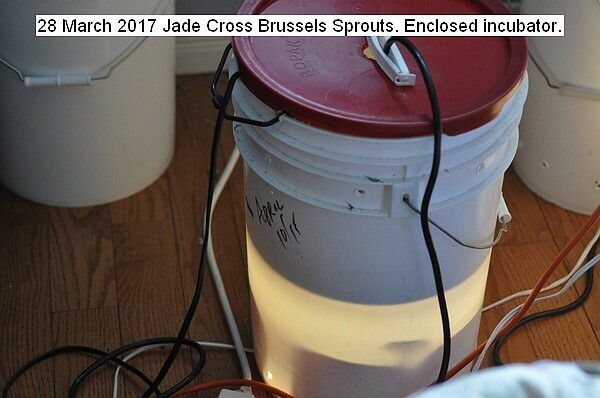 Six Jade Cross Brussels sprouts were started under LED lights in a 23 liter pail with a small fan for some air movement. When the plants are established they will be housed in the greenhouse until planting time outdoors about the middle of May. They are slightly cold tolerant.The lamp setup is ideal for a small quantity of plants. Six plants are my requirements. Jade Cross is a hybrid and produces a perfect plant of sprouts. The seeds were germinated under a wet paper and sprouted in three days. This entry was posted in Uncategorized and tagged 28 March 2017 Brussels Sprouts Seedlings., Brussels Sprouts, Brussels Sprouts Seedlings.. Bookmark the permalink.